The nose has pineapple, lemon and tarmac. The mouthfeel is thin with no cling. The body has pineapple, lemon, dry earth and tarmac. The finish has tarmac and lemon, moving towards tarmac as it dries. Water brings out thick whorling that rapidly spreads out into brief mottling. 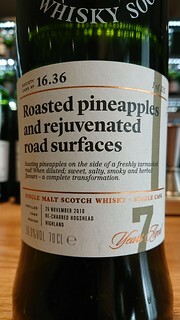 The nose gains smoked toffee, pear, dried pineapple and thyme - and loses the fresh pineapple, lemon and some of the tarmac. The body has the same change at the nose - smokey toffee, pear, dried pineapple, and less of the fresh pineapple and lemon. The finish gains toffee and pineapple, but loses none of the tarmac or lemon. A spritely, eager to please young peated whisky that has a very interesting change with water.